With contributions by Markus Mehring, Phill Parker, David Woods, and Eric Jones. Last revised 21 November 2003. The Hasselblad Lunar Surface Data Camera was fitted with a Reseau plate, which provides a means of correcting images for the effects of film distortion. 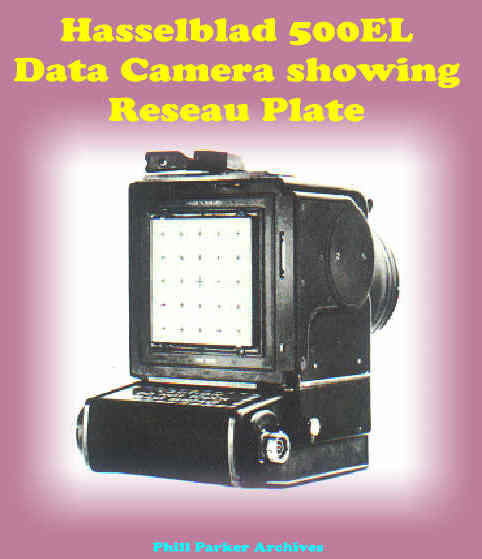 The Reseau plate was made of glass and was fitted to the back of the camera body, extremely close to the film plane. The plate was 5.4 x 5.4 cm in the film plane, which was the useful exposure area on the 70 mm film. The Reseau plate was engraved with a 5 x 5 grid of crosses . The intersections of the crosses were 10 mm apart and accurately calibrated to a tolerance of 0.002 mm. Except for the double-sized central cross, each of the four arms on a cross was 1 mm long and 0.02 mm wide. The crosses (also known as 'fiducials') were recorded on every exposed frame and provided a means of determining angular distances between objects in the field-of-view. When the Hasselblad Lunar Surface Data Camera was fitted with a 60mm lens, the images of the reseau crosses on the film have an apparent separation of 10.3 degrees. With a 500mm lens fitted, the apparent separation is 1.24 degrees. 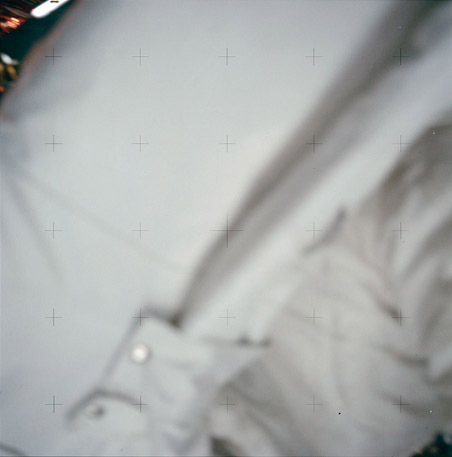 recorded on a blurry spacesuit picture.